This church building and local landmark dates back to 1888 when it was originally called the Iron Church. It was subsequently renamed Invergowrie Parish Church back in 1944 and is now one of only 3 remaining churches in the area that serve the Invergowrie community. Hampton’s were contacted by the Church and asked if we could assist in dealing with a pest bird problem. 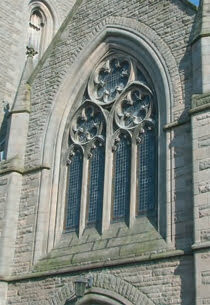 A large amount of pigeons had taken up residence at the front of the church and were roosting in the ornamental stonework around the stained glass windows. Pigeon guano (droppings) were continually amassing all around the front entrance, affecting access to the church as well as causing a potential health risk to the public. There was also a heavy build up of pigeon guano on the stonework below the stained glass windows which looked unsightly and required cleaning up. To gain safe access to deal with the affected areas, Hampton’s used a trailer mounted hydraulic working platform which was ideal for the task. This allowed our two-man team to carry out the careful removal of bird guano and debris from the stonework surrounding the ornamental stained glass windows. All other areas affected by the bird droppings were also thoroughly cleaned. Anti-roosting spikes were then positioned in the small round recesses where the pigeons had been roosting and attached to the stonework using a non-corrosive eco-friendly adhesive. To complete the task an area of exposed stonework directly below the stained glass window area was re-pointed giving the church façade a far more presentable look. 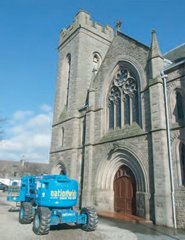 Invergowrie Parish Church is now considering installing more anti-roosting devices in other problem areas within the church complex in order to further eliminate the pigeon problem.